Click HERE for your tickets to the CONCERT! The First Russian Festival in the Triangle! The Rotary Children’s Fund is presenting the first Russian Festival in the Triangle Area. 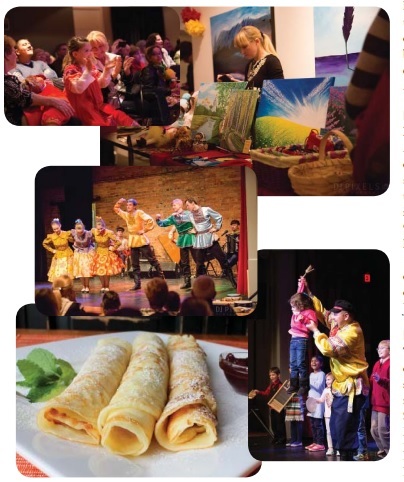 Come join us for the live folk entertainment, kids and adults activities, and delicious Russian food at The Halle Cultural Arts Center of Apex on February 5th from 4:00pm till 9:00pm. *Special guest: professional Georgian dance group! The First Triangle Russian Festival aims to celebrate Russian and former Soviet Republic countries cultural heritage and to introduce it to the American audience, as well as to unite the Slavic communities in the Triangle area. The Festival consists of several zones including craft and educational activities for kids, the food zone (with famous Russian shish-kebab and blini! ), Russian bread for sale, souvenirs and handmade products made from Russia with love. Russia), professional musicians Moscow Nights (Raleigh, USA) and Georgian professional dancers (Tbilisi, Georgia). Eastern European countries through performing arts. Come join to celebrate Russian and Former Soviet Republic countries cultural heritage! We would be happy to see all communities as well as general public. Kids activities are available during the whole Festival! 7:30pm-8:30pm -- Golden Gates Concert**. **Festival is FREE; Concert is $10/Adults and $8/16 and Younger.